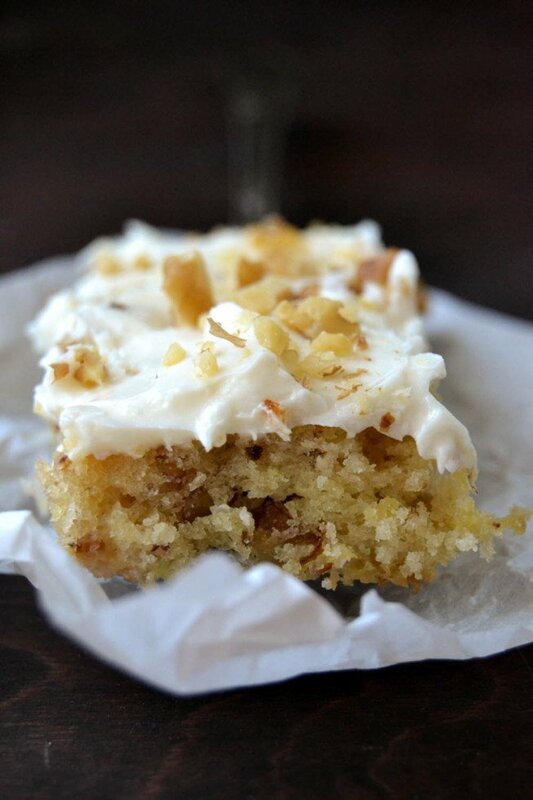 One Bowl Hummingbird Cake Bars ~ these little bars have all the bells and whistles of the classic Southern hummingbird layer cake, in a snack-able bar form. Put the flour, sugar, salt, and baking soda in the bowl of a stand mixer and toss to combine. (You can do this by hand, too.) Mix in the egg, oil,and Bourbon. Blend in the pineapple, mashed banana, coconut,and nuts. Mix just enough to combine all the ingredients thoroughly. Cool the cake before frosting. To make frosting, mix the butter with the cream cheese and then gradually beat in the sugar until the frosting is a spreadable consistency. Blend in the lemon juice and vanilla. Add more sugar if the frosting is too thin. Spread on the cooled cake, and top with more finely chopped walnuts. Store in the refrigerator.